Since the release of their debut album in 1985, Tingstad and Rumbel have been a top-selling duo for Narada Productions with classics such as The Gift, Woodlands, In the Garden and American Acoustic, which won Best Instrumental Album of the Year in. 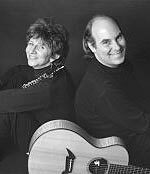 In 2003 Eric Tingstad and Nancy Rumbel won the GRAMMY Award in the New Age category in recognition of “Acoustic Garden” during the 45th GRAMMY Awards in Madison Square Garden. Places are important to Eric Tingstad and Nancy Rumbel. That’s a good thing. After 16 years, fourteen albums and 1,000 performances, they’ve been to a few of them–to Carnegie Hall and to nameless meeting halls, to the National Parks and possibly to the county park down the road from where you live. They have traversed the country with concert hall instruments, playing at the Seed Saver’s Barn in Iowa or an historic plantation in South Carolina. They make hauntingly, drop-dead beautiful, classically inspired music. Tingstad and Rumbel are the number one guitar and woodwind duo in the country, if not the world. And, like the music they make, they are also deeply rooted in tradition, place and craft. The result of that classical training–Tingstad on guitar, Rumbel on oboe–and their inspired improvisation is music both disciplined and innovative, expertly made and imaginative. The unhurried melody, the space between notes, the sheer loveliness of long, undulating lyrical lines. It creates space, expands time, beckons the imagination to wander a while. Audiences grow very quiet during a Tingstad and Rumbel concert, spellbound. And the music transports. Classical fans call the music “intimate and grand, expertly crafted.” Brides and grooms call it “romantic” and happily exchange vows to it. Hospice workers use it to comfort the dying and massage therapists label it as “healing.” The list of committed admirers reads like a demographic of cultural creatives-the Double Reed Society, college music students, the classical-pops crowd. But all agree on a few key terms: serenity, beauty, intimacy, grace. The enthusiastic support Tingstad and Rumbel received from the public for their early performances and recordings gave them the incentive, support and dream to continue their musical partnership. And over the years Tingstad and Rumbel have continued to win the respect of musical peers, accolades from a diverse listening audience and supported causes important to them. They both live near Seattle, have spouses, teen-aged children and a busy life as well as demanding performance and recording careers. They have recorded under the Narada banner since 1985 and are always working on a new release.